Water Filter Kit - 10 in. Filter your tap water and eliminate that no-win decision of "should I buy expensive bottled water or use the chlorinated water from the tap." This water filter kit features a 10" carbon block filter that removes all chlorine and organic flavor. Kit includes 10" housing, one carbon block filter, garden hose attachment, barbed fittings and 6' of 3/8" vinyl tubing. The carbon block should be replaced after filtering approximately 800 gallons of water or after 1 year of use, whichever comes first. Filter should be disassembled and stored dry when not in use. NOTE: This product should not be used in hot water applications. Cold water only! 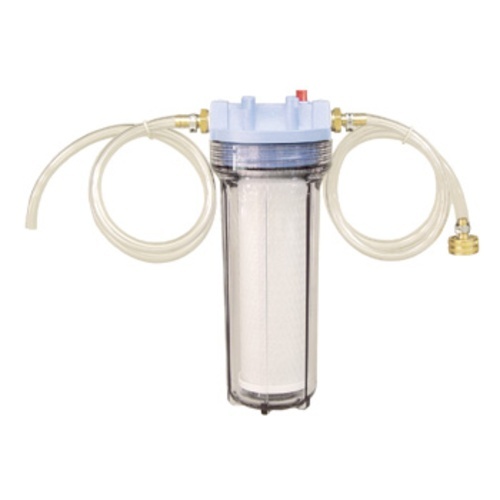 This product includes a carbon filter and is designed to filter water only (Carbon filters should not be used to filter beer or wine). Water Filter Canister Housing - 10 in. Carbon Block Water Filter - 10 in. Bad water in Florida. Need Carbon filter. i wanted more flexibilty when i can brew without having to buy bottled water. really important to remove chlorine in your beer!!! Because my water doesn't taste that great. afordable, high quality water filtration. easy to hook up and use. seems like a no brainer ot me. I did not have one and know how important water is... I had one before and it worked great! I picked this because it looked like a cool thing to hang on my living room wall. Really improved the water quality from my tap. Wet tastes much better after using it. This is a great solution to marginal water. The flow rate is exceptionally good. It can be mounted conveniently to a kitchen faucet with a quick disconnect and works very well. A useful addition would be a mounting bracket or a stand. This is nearly a plug-n-play piece of gear. It cleaned up the smell and taste of water very quickly. Works great. I recommend it. Does exactly what it is supposed to. Filters the hose water to remove chlorine, making for a better brew for those who don't want to get too crazy when dealing with water chemistry. I can't believe I waited this long to buy a water filter. I brewed 2 batches of beer over one weekend and for the cost of what I would have spent on bottled water, I bought this filter system. The water tastes great and I'm sure the beer will also. And I used to have a mental block of only buying the amount of water I thought I needed, and sometimes ran out of sparge water. Now, I reach my target amount and then just keep the water going and heat a couple gallons more than what I calculated. No more running out of sparge water. No more mental block. I'm cured!!! I used to buy jugs of water at the store, but for as often as I brew, it started to add up quick. Then I did refills. Lugging a bunch of containers to the store and back was also a huge pain. Decided to jump on this filter and man, I'm glad I did! Now I not only save time, but I get decent water for my brews. Since it filters out chlorine, I still get the mineral content from my city water (which is pretty decent). Totally worth the money just for the time (and money) you will save! It works well and beats the heck out of buying gallons of bottled water. Note: The cartage is sealed in plastic. You need to take it off before you use it. Saves a lot of money on bottled water!! I've used it so far for two batches of beer. I wish that some instructions had been included. I did find a little on the filter manufacturer's website, which suggest a flow rate not more than 1 gallon per minute, so that's what I did. I collected about 10 gallons before starting to brew in gallon jugs. It is a little tricky to get it to seal well so that it isn't dribbling, but as long as you keep it in your sink while using, that doesn't matter much. I haven't noticed a change in the flavor of either the water or beer, so maybe my water doesn't really need this level of filtration. I was impressed with the weight and strength of the materials in this filter - it can take a lot of water pressure without leaking. The old "household" 10 inch filter housing I had leaked all the time and drove me nuts! This filter produces clean, odorless water even from my tap water which has a noticeable chlorine odor. All in all, I wish I had bought this one years ago and I'm very pleased with it's performance. Highly recommended - more cost efficient and effective than carting around jugs of bottled water. As other reviewers and MoreBeer recommend, need to adjust the flow through the filter to just under one (1) gallon/minute. Must have if your water tastes bad. I should have bought one of these as part of my initial brewing kit. My beers taste so much better, no off flavors. I even tried distilled before getting this filter. This is a must if your water doesn’t taste good. Works great. It's really, really great. Makes great tasting water. That being said, I really bought this for drinking water and still use mostly RO water for brewing. Currently using about 10% tap filtered with this and 90% RO because I have very hard water and this filter does not remove minerals. If I use any more filtered water it is very hard to get mash pH in range. 4 stars because the tubing is pretty cheap and came bent so I had to replace it with more flexible silicone tubing. Nice little filter to clean up the water, easy to use. This works extremely well! It’s a great safe guard as you don’t know the quality of the water or its contents. It takes one more variable out of the equation to make sure you come out with quality brew. Good quality water filter, easy hook ups and simple to use. Competitively priced against other similar alternatives. Shipping was fast and the items were well packaged and protected. I got tired of hauling RO water from a machine so I decided to give this a try. My tap water is already pretty good but it comes out of the charcoal filter without the slightest hint of chlorine, which is a great thing. If you, like me, are putting of water chemistry for a later challenge, this thing is a must have for the use of tap water. Once I finally get an RO machine and all the stuff needed to build my water I'll put this bad-boy under my kitchen sink! Chlorine can add a medicinal or band-aid type flavor to beer. Lighter beers like pilsners are especially susceptible. After brewing a nice band-aid flavored beer, I purchased this filter and I have not had any trouble since. I run mine from a RV hose about 30 feet away from my brew pot so a on/off valve in-line would really help. If you're brewing all grain, you can't afford not to have a water filter. This one is great and ready to use out of the box. I brew outdoors and hook it right up to my water hose. I've had this for a year and I have nothing bad to say about it. I used to buy jugs of water at the super market, but hooking this up to my tap is much easier and does save some money in the long run. I'd recommend this to anyone interested in a filter for brewing. quit using bottled water since i got this. the money i saved by that paid for this in just a few batches. the final beer turns out the same. Easy to setup and use off my basement sink. I live in Chicago area and can definitely taste an improvement in my tap water after running it through this filter. Integrated this guy into my process and my beers have greatly improved. My city water is pretty good as is, but this still made a noticeable difference. The value is fantastic too with the included stainless fittings, filter, and tubing. easy to assemble, but they need to add some directions on recommended usage for the first time, like do you run it for a while to filter out loose carbon? I don't trust my city's water report and won't drink the tap water either. The water quality is considerably better when using this filter system. If you're looking to take the next step in better beer and haven't address you water this should be your first step in controlling your water source. Why did I wait so long to buy this?! I used to purchase 5 one gallon jugs of Spring Water for small batch brewing and after using this I immediately facepalmed myself. This saved so much time and made the brewing process faster and easier. My only regret about this purchase is waiting this long to get one! Cleans up the chlorine and hooks up easily. I use this to filter the chlorine from water with a charcoal filter, then switch over to a 1 micron filter to remove sediment from beer prior to kegging. This filter housing works great for both purposes and is easy to change filters! Take water issues out of the equation! This filter makes it easy to be sure you're starting off your brew session with good quality water which will give your beer the best chance of tasting great in a few weeks. There's nothing worse than detecting some weird flavor in your finished beer and wondering if (among many other factors) your brewing water was at fault. Just run your water through this filter and you'll have one less potential problem to worry about! This filter does a really good job of getting the smells and tastes out of your standard tap water. Where I live, I would consider the water unusable for home brewing. I have resorted to using 7 gallon jugs to get water from a neighboring town, or RO water, but then you have to deal with putting all of your minerals, etc. back in it. This filter takes out the funny smells and tastes and is convenient to use and then take apart to dry. Why did we wait so long! Ease of use and saving a lot of trips to the water store. Had been contemplating making our own, or buying one from a hardware store, but after reading the reviews for the umpteenth time we decided to buy this water filter and haven't looked back. Just what I needed. Buying water is unnecessary with this filter. I'm saving a minimum of $6 a batch. Running low and slow produces nice chlorine free H2O. Excellent quality. This filter works very well. It has a solid design, and definitely gets gets the job done. While it won't do much for the mineral composition of your water, I have not tasted any off flavors due to Chlorine in my beer when using this filter. If you aren't using a reverse osmosis, you should be using one of these at least. I have tested the PPM before and after filtering. It seems to work great. I have seen it take 100-200ppm out of the water. Lately I have been getting brewing water around 250PPM. I have not tested exactly what is inside those ppm yet. The beer is turing out great so I will accredit some of that greatness to this filter. This is a very simple and straight forward water filter, but with that being said I don't brew without using water that has been filter and this was the best investment for filtering in my brewing system. I would highly recommend this for any new brewer just looking to get a more solid base in their expanding brewery setup. I do almost all of my brewing outdoors on my back patio, where the garden hose is the most readily available water source. By running the hose through the filter I am able to have clean, filtered water whenever I need it and in an unending supply. Last piece of the puzzle to the brew stand. 6 batches in and looking good! Great product! Once I mounted the filter on the wall it was the easiest thing to use and cheaper than some of the other alternatives in the market. I wish the bracket came with proper mounting screws though. Water filter kit works great. And if you want to remove chloramines, follow MoreBeer's advice and use at a fill rate of less than 1 gallon per minute - this was backed up by other research I found online. And it's flexible too. You can buy other 10" filters (like FIL62 or FIL65) and use the same assembly to filter your beer. Don't use the carbon filter in this kit to filter beer! All you have to do is find the right fittings to use with your brewing setup! Sounds great being able to get double duty filtering - water AND beer. I was looking at a separate beer filter. Do they have quick disconnect adapters to allow switching from garden hose for water to ball lock adapters on both ends for keg to keg beer filtering? This is a great filter. TIP: make sure you leave this filter out to dry after you use it. Otherwise it can get funky and you'll get mold or worse. Makes filtering water a breeze! Works perfectly for filtering my water quickly for the brew day. The filter dries quite quickly after use as well, making storage and clean up very easy. Highly recommend! I hook this up in my laundry room and it saves me a trip to the grocery store to load up on gallon jugs. Up front, it's a bit more, but between the convenience and the savings after a few brew sessions, it's 100% worth the price. Works as intended as is saving me tons of money on water. I was using a RV filter from Lowes but was constantly having problems with low flow or leaks. This worked perfectly right out of the package. I would recommend these to anyone. Why wouldn't you want to filter your water? They are super easy to use. I brew with municipal Lake Ontario water. It's quite good in the cool months, but come late fall, the taste can become a bit funky as the chlorine level is adjusted to combat the summer's tiny lake critters. The unit and filter are made by a top class manufacturer. It is used in dispensing soda and coffee from commercial machines. This would be a great home filter for an ice maker, etc. The cartridge can treat up to 800 gallons. And I bought it on a Beer Deal special!